A number of casino tycoons and entrepreneurs with Asian gaming interests have climbed the ladder in the latest wealth rankings from U.S.-based magazine Forbes, published on Tuesday. Among them are several billionaires – in U.S. dollar terms – that are linked to Macau’s gaming industry. Forbes said it was a record year for the richest people on earth, as the number of billionaires jumped 8.1 percent to 2,208, from 2,043 in 2017. Altogether they are worth a record US$9.1 trillion, up 18 percent from a year ago, according to the magazine. 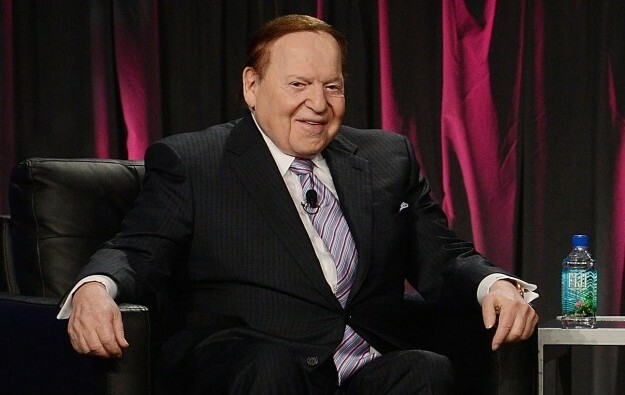 Sheldon Adelson (pictured), chairman and chief executive of casino developer Las Vegas Sands Corp, which operates casinos in Macau and Singapore, remained the richest entrepreneur among the world’s gaming billionaires, despite dropping one position in the overall ranking. Mr Adelson ranked 21st among billionaires worldwide in the Forbes 2018 World’s Billionaires list with an estimated net worth of US$38.5 billion. It was a US$8.1-billion increase – or 26.6 percent – on his 2017 estimated net worth of US$30.4 billion. Lui Che Woo, founder and chairman of Macau gaming operator Galaxy Entertainment Group Ltd, climbed 59 places to 50th, on this year’s list. He is ranked second among gaming billionaires, with an estimated US$20.1 billion, up from US$12.1 billion last year. Johann Graf, founder and CEO of Austrian gaming equipment maker Novomatic AG, is the third-richest gaming billionaire in the world. Mr Graf is worth an estimated US$8.1 billion, ranking 186th in this year’s overall list. Members of the Ho family – Pansy Ho Chiu King and Lawrence Ho Yau Lung, children of Macau casino tycoon Stanley Ho Hung Sun – also saw their wealth grow this year. Ms Ho, co-chairperson of Macau casino operator MGM China Holdings Ltd, gained an estimated US$1.1 billion and was ranked 365th in this year’s Forbes’ list, with a worth of about US$5.3 billion. She was listed as the fifth-richest person among gaming billionaires. Lawrence Ho, chairman and chief executive of Melco Resorts and Entertainment Ltd, jumped 325 spots and is now ranked in 965th place, with an estimated US$2.5 billion, compared to US$1.6 billion in 2017. Mr Ho is the youngest gaming executive on the list at 41 years old. Angela Leong On Kei, fourth consort of Stanley Ho and a director of SJM Holdings Ltd, appeared in 606th place in this year’s overall list, down from 427th place last year. She is worth an estimated US$3.7 billion, compared to US$4.1 billion in the 2017 list. Lim Kok Thay, chairman and chief executive of Malaysia-based gaming group Genting Bhd, ranked 441st, worth an estimated US$4.7 billion. Cui Li Jie, the controlling shareholder of Saipan casino investor Imperial Pacific Holdings Ltd, remained in this year’s list, ranked 1,999th, worth an estimated US$1.1 billion. James Packer – one of the largest shareholders in Australian casino operator Crown Resorts Ltd – ranked 527th in the Forbes list, worth an estimated US$4.1 billion. Steve Wynn, who resigned last month as chairman and CEO of Wynn Resorts Ltd and of Macau casino developer Wynn Macau Ltd, saw his wealth increase to US$3.4 billion, from US$2.5 billion in 2017. His ranking rose 135 places to 679th. Mr Wynn’s ex-wife, Elaine Wynn, is ranked 965th in this year’s list, worth an estimated US$2.5 billion. Chen Lip Keong, chief executive and controlling shareholder of Cambodian casino operator NagaCorp Ltd, saw its ranking soar 587 places in 2018, to 703rd in this year’s list, worth an estimated US$3.3 billion, compared to US$1.6 billion in 2017. Japanese casino and pachinko mogul Kazuo Okada saw his net worth increase to US$3.0 billion, from US$2.4 billion in 2017. Mr Okada saw his ranking soar to 791st, from 867th last year. Teddy Sagi, co-founder of Playtech Plc, a provider of software and content for the online, mobile and land-based gaming industries, was the second-youngest gaming executive on the list, at 46 years old. Mr Sagi ranked 679th, worth an estimated US$3.4 billion. Top of the 2018 list is the founder and boss of online giant Amazon.com Inc, Jeff Bezos. Mr Bezos’ fortune soared to an estimated US$112 billion from an estimated US$39.2 billion last year. Mr Bezos knocked Microsoft Corp founder Bill Gates, whose estimated wealth is US$90 billion this year, up from US$86 billion, into second place. Mr Gates had headed the list for 18 of the past 24 years. U.S. investment expert Warren Buffett, chairman and CEO of Berkshire Hathaway Inc, ranked third, with an estimated US$84 billion.